Observational Evidence of Gas Accretion Onto Galaxies? 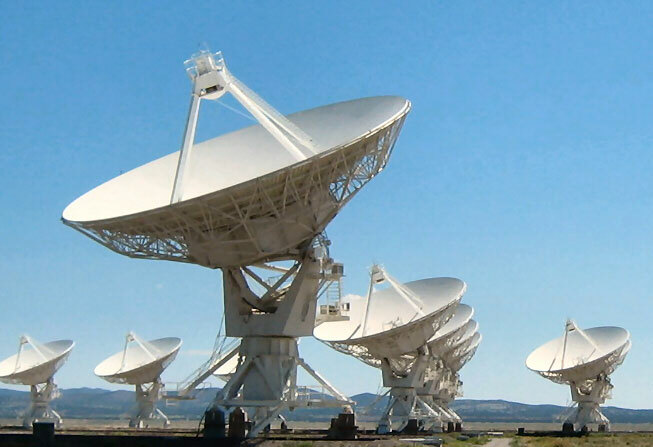 The Observatory has completed the Semester 2015B time allocation process for the Very Large Array (VLA) , the Very Long Baseline Array (VLBA) / High Sensitivity Array (HSA) , and the Green Bank Telescope (GBT). A total of 276 new proposals were received for the 2 February 2015 submission deadline. In aggregate, the proposals covered the broad spectrum of modern research in astronomy and astrophysics. The proposals were reviewed for scientific merit by eight Science Review Panels (SRPs) and for technical feasibility by NRAO staff. These were completed in March and then considered by the Time Allocation Committee (TAC) at a face-to-face meeting on 27-28 April 2015 at NRAO in Charlottesville, VA. The TAC consists of the chairs of the SRPs and was charged with recommending a science program for Semester 2015B to the NRAO Director. The recommended program was reviewed and approved on 14 May 2015. A disposition letter was sent to the principal investigator and co-investigators of each proposal on 28 May 2015. A TAC report containing information for proposers and observers, including statistics and telescope pressure plots, was released the same day. The approved science program has been posted to the NRAO science website. For each approved proposal in the science program, the Proposal Finder Tool will have access to its authors, title, abstract, and approved NRAO hours. The Observatory welcomes community feedback on its proposal review and time allocation process. Please provide such feedback via the Proposal Review department of the Observatory's Helpdesk. Save The Dates: 15-17 December 2015! The NRAO is organizing a series of three conferences for the broader community to discuss potential U.S. futures for radio-millimeter-submillimeter science in the 2020’s and beyond. Funded by Associated Universities, Inc. (AUI) and the Kavli Foundation, the first of these meetings will take place 15-17 December 2015 in Chicago at a to-be-determined hotel near the O’Hare Airport. The Science Organizing Committee co-chairs for this meeting will be Mark Reid (CfA) and Jean Turner (UCLA). So please save these dates ­(15 – 17 December 2015) and join us for this important and exciting discussion of the future of U.S. radio-millimeter-submillimeter science. More information about this meeting will appear in the next (July) eNews, including the conference website and registration information. The VLA Sky Survey (VLASS) proposal and Technical Implementation Plan (TIP) underwent a community review by a panel chaired by Andrew Baker on 4-6 March 2015. The review materials, including the proposal, the TIP, and presentations from the review, are available on the NRAO VLASS wiki. The panel report was received 13 May and contained a number of recommendations, described below. The VLASS proposal reviewed by the panel comprised a two-tier S-band survey: (a) ~5400 hours for "All-Sky", and (b) ~3400 hours for "Deep" observations of 10 square degrees, to be executed in the B, BnA, and A configurations. The observations would take place over three epochs covering six configuration cycles (seven years). The primary recommendation of the Community Review Panel is that the first two epochs of the "All-Sky" tier be approved, provided a clear plan for the delivery of basic and enhanced data products are presented at the preliminary design review. The third epoch should proceed only after the successful and timely delivery of basic and enhanced data products from the first two epochs. The Community Review Panel recommended that the "Deep" tier be carried out via regular proposal requests. For the "All-Sky" tier of the survey, as proposed, the impact is just over 900 hours per configuration cycle, or 13% of the time available for Pricipal Investigator science. NRAO will continue to work with the VLASS team to complete the survey design, and will strive to minimize the survey’s impact on VLA operations and science time. The survey will undergo a series of technical design reviews in the near future. Additional comments on the science and operational impacts from the community on VLASS are welcomed – please contact me at tbeasley@nrao.edu. The decision whether or not to proceed with VLASS will be made late this year. In the spirit of facilitating all interested attendees to participate in the workshop, the NAASC is offering modest financial support, considered on a case-by-case basis, to help mitigate attendance challenges. Please see the registration page on the workshop website for more information about this program. future observations and possible special purpose instruments or telescopes/missions that could facilitate direct observations of gas accretion onto galaxies. We look forward to seeing you in Charlottesville in October! 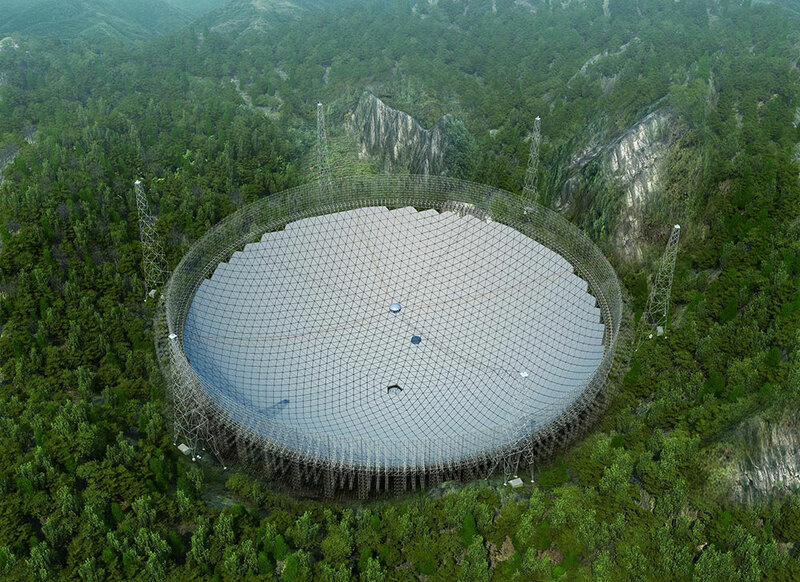 NRAO and the Shanghai Astronomical Observatory (SHAO) are organizing the fourth in a series of China–U.S. radio astronomy workshops, titled "Scientific and Technical Drivers for the Next Generation of Radio Telescopes." The workshop will be held at SHAO in Shanghai from 14 – 16 October 2015. The purpose of the workshop is to build and strengthen collaborations between the U.S. and Chinese radio astronomy communities. 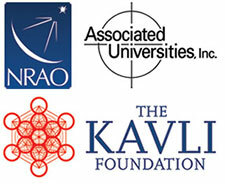 It will include discussions on both science and instrumentation, with a focus on projects and programs that will feed into the next generation of radio astronomy facilities, such as the Five-hundred-meter Aperture Spherical Telescope (FAST) and the next-generation Very Large Array (ngVLA), as well as future Very Long Baseline Interferometry (VLBI) capabilities in space and on the ground. Scientists from the U.S. interested in participating in the workshop should contact Jim Braatz. For more information, please visit the workshop website. The optical recombination lines of hydrogen are commonly used to estimate star formation rates in nearby, normal galaxies. For galaxies with obscured nuclear star formation, diagnostic emission that is less susceptible to dust extinction must be used. In a recently published paper, G. Bendo and his collaborators use Cycle 0 ALMA data to measure emission from the 99 GHz hydrogen recombination line H40α (see Figure), and the associated continuum emission, in order to estimate the star formation rate of NGC 253. They measure emission emanating primarily from three nuclear components and estimate total star formation rates of 1.87 and 1.59 M⊙ per year via the line and free-free continuum emission, respectively. The authors also compare their H40α line strength with prior measurements of near-infrared hydrogen recombination lines and derive an extinction to the nucleus at near-infrared wavelengths of 4-5 magnitudes. The success of this Cycle 0 data study bodes well for the future use of this technique to estimate star formation rates with ALMA in full science operations. The ALMA Front End Handling Vehicle installs an ALMA Front End in a 7m antenna. In early May, ALMA completed Early Science Cycle 1 and Cycle 2 observations in the most compact configuration, and antennas were moved to the more extended C34-3(4) configuration (1.1” beam at 100 GHz), as announced earlier. 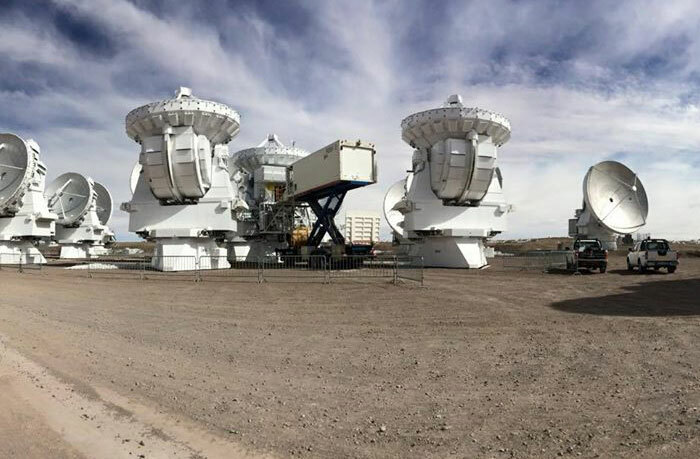 Observations were completed in that configuration by month’s end and the array has been reconfigured to C34-5 (0.75” beam at 100 GHz), characteristics of which may be examined at the ALMA status page. By the end of June, the array will be moved to its most extended Cycle 2 configuration, achieving a 0.4” beam. As austral fall season gives way to early winter, improved weather has enabled very efficient observing. Technical justification and initial science assessment are under way by the 96 members of the Cycle 3 review panels. The 12 panels meet in Osaka, Japan 22-26 June to come to a preliminary ranking of the 1582 proposals received for Cycle 3. The final ranking of the proposals is expected to be announced in August. Cycle 3 observations will begin 1 October 2015. The NRAO Users Committee and its subcommittee, the ALMA North American Science Advisory Committee (ANASAC), met in Green Bank, West Virginia 20-22 May. The Committee voiced a number of recommendations to the ALMA project for improvements. North America ALMA issued a call for proposals for Development Studies in March 2015. Prospective proposers were asked to file Notices of Intent by 1 May to guide the constitution of review committees for the proposals. Twenty notices were received from across the North American ALMA partnership. The deadline for receipt of the proposals is 12 June. Artist illustration of a reflectionless filter designed by the NRAO CDL. NRAO has entered into a licensing agreement with Mini-Circuits, headquartered in Brooklyn, N.Y., to permit the use of NRAO-developed technology in a new suite of commercial electronics products. Mini-Circuits is a global leader in the design, manufacture, and distribution of RF, IF and microwave components, subassemblies and test solutions for commercial, industrial, medical, space and military applications from DC to 40 GHz. This new agreement, which covers a part of the NRAO portfolio of radio frequency filters known as cascadable absorptive filters, will foster the development of new radio-frequency-based technologies in a wide range of commercial applications. The underlying technologies for this novel class of filters were developed at the NRAO Central Development Laboratory (CDL), where some of the world’s most sophisticated radio astronomy technologies are engineered. Filters are a fundamental building block of nearly every RF system in existence today, and are used to eliminate unwanted signals in receiver and transmitter architectures. Traditional filters work by reflecting undesired signals back to the source, which can potentially cause systemic problems such as intermodulation products and gain ripples that adversely affect desired signals in the pass band. This new, patented filter topology, which was developed by NRAO Scientist Matt Morgan, avoids these problems by absorbing unwanted signals in the stop band. The key to the performance of these new filters is their unique topology, and the methods discovered at the CDL for extending it to create even more sophisticated designs. The result is a filter that is more compact and better suited to practical implementation than other methods for absorbing stop-band energy. For example, in contrast to terminated diplexers, these filters are symmetric and absorptive from both sides, and maintain good impedance match even in their transition bands. They also use fewer and more moderate element values than conventional filters at the same frequency, facilitating their realization as mass-producible and inexpensive printed circuits, yet still performing well even up to 40 GHz using on-chip lumped elements. The filters in their present form are also compact. 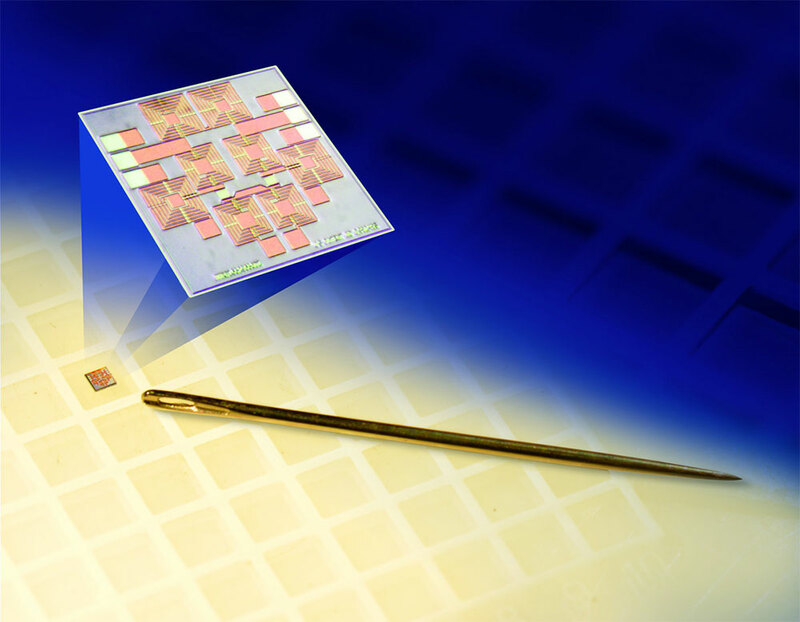 The individual GaAs die are 1mm square, and are available for chip and wire integration, or in 3mm Quad-Flat No-lead (QFN) packages for surface mount applications. Each chip provides ~15 dB of absorption in the stop-band, and may be cascaded for additional rejection as needed. Because the filter chips provide ~20 dB return loss at all frequencies within the operating range, including pass-band, stop-band, and transition-band, they may be dispersed anywhere they are needed in the signal path of a radio frequency system without risk of causing problems via out-of-band interactions with other components. Finally, as monolithically fabricated passive integrated circuits, they exhibit very uniform, temperature-stable performance, easing their use in applications where stable amplitude and phase or well-matched pairs are needed. This reflectionless filter topology represents a breakthrough in a long-standing problem of embedding filters within RF transmit and receiver chains. These filters eliminate the need for additional attenuators and isolation amplifiers around sensitive components, enabling significant improvement in overall system dynamic range. The licensing agreement is facilitated by the NRAO Technology Transfer Office, which was established to fulfill the U.S. Congressional directive to support commercialization of federally-funded research and technology development. Research Digital Engineer: The NRAO is seeking to hire a Research Digital Engineer. The successful candidate will be a member of the NRAO Scientific Staff and will join the Digital Signal Processing (DSP) group in the Central Development Laboratory (CDL) in Charlottesville, VA. She/he will be responsible for leading a program of innovative design and development in mixed-signal integrated circuits and digital signal processing as applied to astrophysical observations. 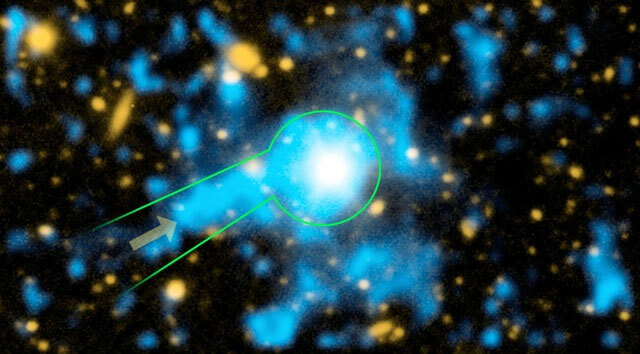 This has been identified by NRAO as a key technology area for the next generation of radio telescope instrumentation. Digital Engineer: The NRAO in Charlottesville, VA is seeking to hire a Digital Engineer with a signal processing background who is familiar with FPGAs and embedded processors and who is experienced in programming these devices. Experience in working with the LabView FPGA development platform is highly desirable, as is familiarity with the ROACH architecture within the CASPER development environment. Research Engineer in Millimeter and Submillimeter Wavelength Electronics: The NRAO in Charlottesville, VA seeks a Research Engineer in millimeter and submillimeter wavelength electronics. The successful candidate will be a member of the NRAO Scientific Staff and will join the millimeter/submillimeter receiver group in the Central Development Laboratory in Charlottesville, VA. She/he will play a leading role in a program of design and development of low-noise millimeter/submillimeter wavelength instrumentation for astrophysical observations. This has been identified by NRAO as a key technology area for the next generation of radio telescope instrumentation. Millimeter Wavelength Electronics Engineer: The NRAO in Charlottesville, VA seeks an Engineer with expertise in millimeter/submillimeter wavelength electronics. The successful candidate will join the millimeter/submillimeter receiver group in the Central Development Laboratory (CDL) in Charlottesville, VA. She/he will be involved in a program of design and development of low-noise millimeter/submillimeter wavelength instrumentation for astrophysical measurements. This has been identified by NRAO as a key technology area for the next generation of radio telescope instrumentation. Assistant Scientist: The NRAO in Socorro, NM is accepting applicants for an Assistant Scientist position. The staff scientist recruited for this position is expected to facilitate and enable cutting‐edge science by community members and work to enhance the observing capabilities for the Very Large Array. The ideal candidates will contribute to the overall NRAO mission and must be able to demonstrate success working within a collaborative environment that promotes motivation, leadership, and team building. The web page for the IAU Historic Radio Astronomy Working Group includes a link to the agenda for the 5 August 2015 General Assembly program, The Golden Anniversary of the 1960’s: The Golden Years of Radio Astronomy, as well as a Contributed Papers and a Business Meeting Session, Working Group reports, pages for Grote Reber Medal awardees, and Biographical Memoirs of recently deceased radio astronomers. A Biographical Memoir of likely interest to NRAO eNews readers is Paul Vanden Bout's nice contribution on Bob Brown. About this month's photograph: Participants in NRAO summer student programs arrive at their respective NRAO sites in late May and early June. Since its inception in 1959, the summer student program has engaged over 1,000 young people in scientific research, and many NRAO summer students have gone on to distinguished careers in astronomy and other physical sciences. The list of former NRAO summer students includes women and men who represent a wide range of career stages, research interests, geographic locations, and ethnic backgrounds. And there is clearly occasional fun mixed in with the scientific research. 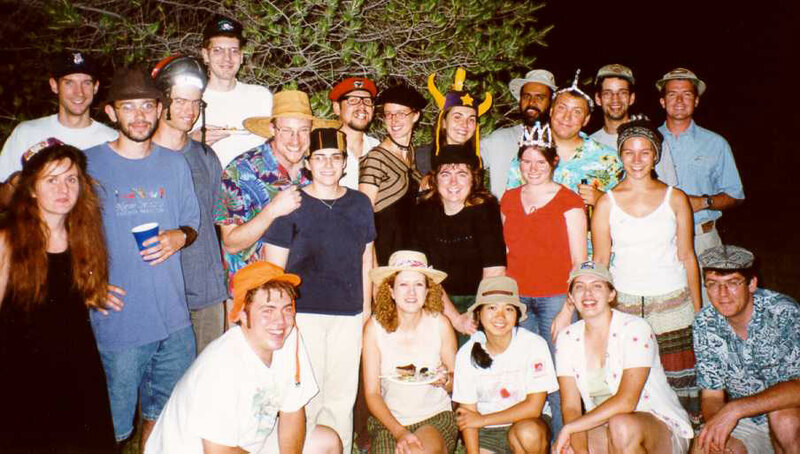 This "mad hats" photo, taken in summer 2000, includes Socorro Research Experiences for Undergraduates (REU) students, some of their advisers, and others. [Left to right: row 1, kneeling]: Nate Murphy (?) – REU, Terese Ostrowski – REU, Stacy Teng – REU, Ashley Zauderer – REU, Marc Verheijen – Jansky Fellow. [Row 2, immediately behind kneeling row]: Lori Lubin – Chris Fassnacht's spouse, Tracy Clarke – Jansky Fellow and co-leader of the 2000 REU program, Kate Becker (?) – REU, Melanie Clarke –REU. [Row 3, standing]: Marti Roos ­– spouse of Jansky Fellow Marc Verheijen, Tim Woodruff (?) – REU, Nate Dale – New Mexico Tech undergrad, Chris Fassnacht – Jansky Fellow and co-leader of the 2000 REU program, Mike Fallon – spouse of NRAO pre-doc Cornelia Lang, Cornelia Lang – NRAO pre-doc, Andreea Petric – NRAO pre-doc, Kumar Golap – NRAO/NM staff, Rick Mellon – REU, Geoff Bower – Jansky Fellow, Dave Lord – postdoc at NM Tech's Petroleum Recovery Research Center. [Row 4]: Neal Miller – NRAO pre-doc, James Anderson – NM Tech grad student. Photographer unknown, possibly Walter Brisken. Thanks to Chris Fassnacht for identifying the mad hatters. If anyone can verify names, please contact archivist@nrao.edu.